Statistics is a vital tool to provide the inference in medical research. Choosing an appropriate statistical test plays a vital role in analysis and interpretation of the research data. In the past four decades, it has been observed that use of diversified statistical methods has amplified to a greater extent in medical research publications; however, it is pertinent to mention here that the standards of reporting statistical tests and using them are very low as many shortcomings and pitfalls have been observed in the studies published in past in various biomedical journals. This is a serious problem, and it leads to misleading conclusions, wrong inferences, hazardous clinical consequences, and utter waste of resources. The data must be measured on an interval or ratio scale. Nonparametric tests are usually referred as distribution-free tests. A nonparametric statistical test is the one that does not necessitate any conditions to be fulfilled about the parameters of the population from which the sample was drawn. Nonparametric tests can also be used when the data are nominal or ordinal., Nonparametric tests are also applied to the interval or ratio data which do not follow the normal distribution. Independence of samples - for parametric tests to be used the samples drawn from the population must be independent. No such assumption is required for nonparametric tests. 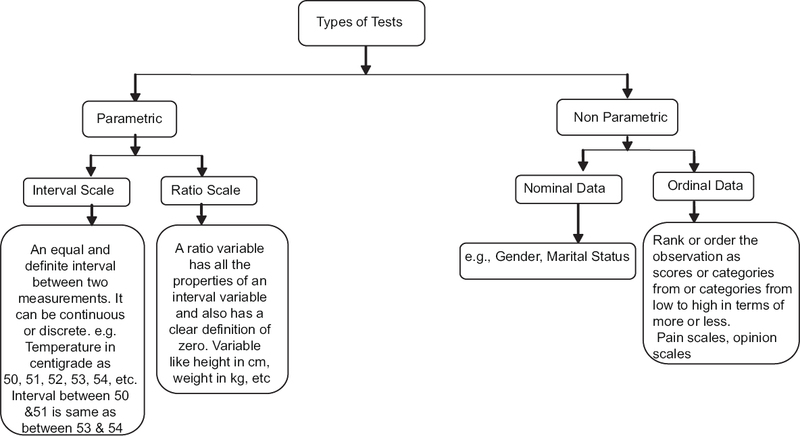 Figure 1: Use of parametric or nonparametric tests according to the scale of measurement of the data. 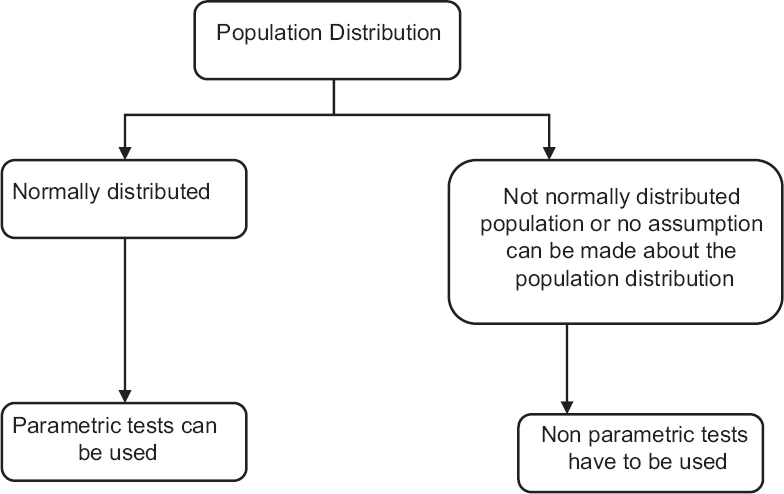 Figure 2: Use of parametric versus nonparametric tests according to population distribution. Inference drawn from parametric tests is easy to interpret and more meaningful than that of nonparametric tests. Many nonparametric tests use rankings of the values in the data rather than using the actual data. Knowing that the difference in mean ranks between two groups is five does not really help our intuitive understanding of the data. On the other hand, knowing that the mean systolic blood pressure of patients taking the new drug was 5 mmHg lower than the mean systolic blood pressure of patients on the standard treatment is both intuitive and useful. The most important point while analyzing the data is to understand the fact that whether your data are better represented by mean or median. This is the key to decide whether to use a parametric or a nonparametric test. If the data are better represented by median then use a nonparametric test. For better understanding of the fact, let us explore an example. Suppose a researcher is interested in knowing the average income of the people in two groups and want to compare them. For this type of data, median will be the appropriate measure of central tendency, where 50% of the people will be having income below that and 50% will be having income above that. If we add some highly paid people in the group than those will act as outliers and mean will differ to a greater extent, however income of a particular person will be the same. In that case, the mean values of the two samples may differ significantly but medians will not. In such cases, using nonparametric tests is better than parametric tests. When we have ordinal data, nominal data, or some outliers in the data that cannot be removed then nonparametric tests must be used. For all the parametric tests, there exists a parallel nonparametric equivalent. [Table 1] describes in brief the type of situation under study with some examples and the relevant parametric tests and their nonparametric equivalents to be used in those situations. Suppose a researcher designed a protocol to study the effectiveness of an analgesic in the patients with arthritis. He/she recruits 12 participants and randomized them into two groups to receive either the new drug or a placebo. Participants are asked to record the intensity of pain on a scale of 0–10 where 0 = no pain and 10 – severe pain. The hypothetical data are shown in [Table 2]. The investigator wants to explore the difference in the intensity of pain in the participants receiving the new drug as compared to the placebo? 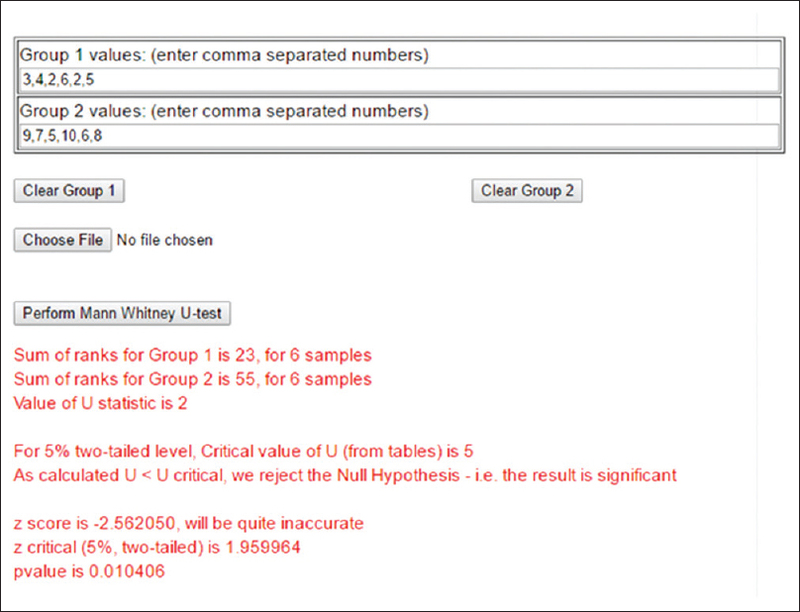 In this example, since the data are on an ordinal scale, hence we will use Mann–Whitney U-test to compare both the groups. The link to the online calculator for performing Mann–Whitney U-test is http://scistatcalc.blogspot.in/2013/10/mann-whitney-u-test-calculator.html. Step 2: Click on perform Mann–Whitney test option and you are done. The output of the test is shown in [Figure 4]. Figure 3: Data setup for a Mann–Whitney test in the online calculator. Figure 4: Output of the Mann–Whitney test from the online calculator. The result obtained from online calculator states that there is a significant difference between the intensity of pain in the two groups and P = 0.0104. Parametric and nonparametric are two broad classifications of the statistical tests. Parametric tests are based on the assumptions about the population from which the sample has been drawn; the most common among them is the assumption of normality. If the underlying assumptions of the parametric tests are not fulfilled using them may lead to incorrect conclusions. Utmost care should be taken while choosing between parametric and nonparametric tests and all the assumptions related to both of them must be considered while choosing one over the other. Rosner B. Fundamentals of Biostatistics. California: Duxbury Press; 2000. Motulsky H. Intuitive Biostatistics. New York: Oxford University Press; 1995. Walsh JE. Handbook of Nonparametric Statistics. New York: D.V. Nostrand; 1962. Conover WJ. Practical Nonparametric Statistics. New York: Wiley and Sons; 1980.